I was driving home with Pearl from her baby sitter’s home yesterday. Guess what she did on the way home?? Oh Dear!! 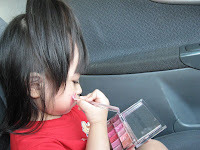 ;0 She grabbed hold of my make-up bag from the side door compartment without me realizing it coz I was busy driving. I tried to talked her into surrendering it back to me but….sorry la the lip gloss compact is what she has been longing to explore since the first time she saw me using it. I tried to grab it back but she turned her back at me. Well safety comes first got to keep my eyes on the road and hands on the steering wheel, can’t do much with my new lip gloss compact. She Dipped and brushed on her cheek all the way, I can't help but to capture her naughty act when I safely parked at my parking bay. The daddy was shocked looking at her and asked worryingly “What happen to her face? ?” “She played with my lip gloss lah.” I replied. Luckily the journey is not that far or else she would be like a little clown or red Indian by the time we reached home.